Arthritis is a significant cause of disability and pain among US adults, and is particularly common among those with other chronic conditions, such as heart disease, diabetes, or obesity. Unfortunately, the number of adults with arthritis in the United States continues to increase, with the prevalence of the disease expected to reach >78 million by the year 2040, according to a recent report published by the Centers for Disease Control and Prevention (CDC).1 The report also revealed that, along with an increase in the number of adults diagnosed with arthritis, there has been a concerning rise in the number of individuals whose activities are limited because of their disease. “Arthritis is common among adults with heart disease, diabetes, or obesity, and the combination of arthritis and one of these chronic conditions has been associated with higher levels of physical inactivity, suggesting that arthritis-specific barriers to physical activity (concerns about worsening pain, damaging joints, and safely exercising) might be important concerns for adults with those conditions,” lead author Kamil E. Barbour, PhD, Arthritis Program, Division of Population Health, National Center for Chronic Disease Prevention and Health Promotion, CDC, Atlanta, GA, and colleagues stated in the report. The CDC report was based on an analysis of recent data from the National Health Interview Survey, a yearly, in-person US survey that captures nationally representative estimates on a wide array of health status and behaviors among the nonmilitary, noninstitutionalized adult population. In this survey, adults were identified as having doctor-diagnosed arthritis if they answered “yes” to the question, “Have you ever been told by a doctor or other health professional that you have some form of arthritis, rheumatoid arthritis, gout, lupus, or fibromyalgia?” Participants who answered “yes” to this question were also asked, “Are you now limited in any way in any of your usual activities because of arthritis or joint symptoms?” Those who answered “yes” to both questions were classified as having activity limitations attributable to arthritis. Data from the survey revealed that from 2013 to 2015, >54 million adults in the United States confirmed that they had doctor-diagnosed arthritis. Among those individuals, >23 million reported that their disease had limited their activities. 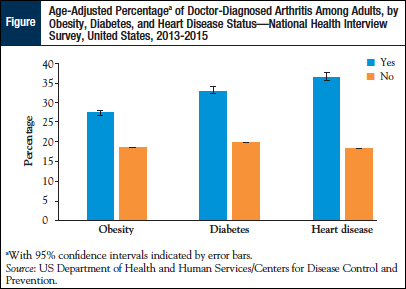 As is shown in the Figure, adults with obesity, diabetes, or heart disease were more likely to have arthritis, and, not surprisingly, the age-adjusted prevalence of arthritis-related activity limitations was high in those who had these comorbidities (ie, obesity, 45.2%; diabetes, 52.5%; and heart disease, 54.8%). These findings confirm a rise in the prevalence of adults with arthritis whose activities are limited by their disease (42.8% in 2015 vs 35.9% in 2002), a trend that has serious implications for individual patients, as well as the healthcare system as a whole. 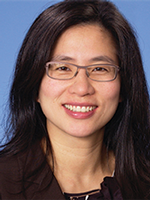 “The prevalence of arthritis-attributable activity limitations among adults with arthritis increased by almost 20% over time (2002-2015) independent of the aging of the U.S. population, resulting in greater pain, disability, costs, and decreased quality of life,” Dr Barbour and colleagues said. The agency will also be allocating funds to several states to promote these interventions. Barbour KE, Helmick CG, Boring M, Brady TJ. Vital Signs: Prevalence of Doctor-Diagnosed Arthritis and Arthritis-Attributable Activity Limitation—United States, 2013-2015. MMWR Morb Mortal Wkly Rep. 2017;66:246-253.